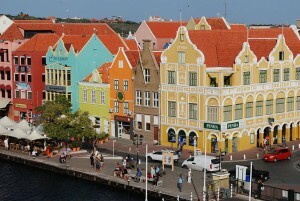 Willemstad’s colorful harbor viewed from a cruise ship. 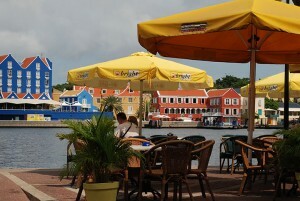 Few Caribbean ports of call can surpass the arrival awaiting passengers whose ship docks in Willemstad’s St. Anna Bay. 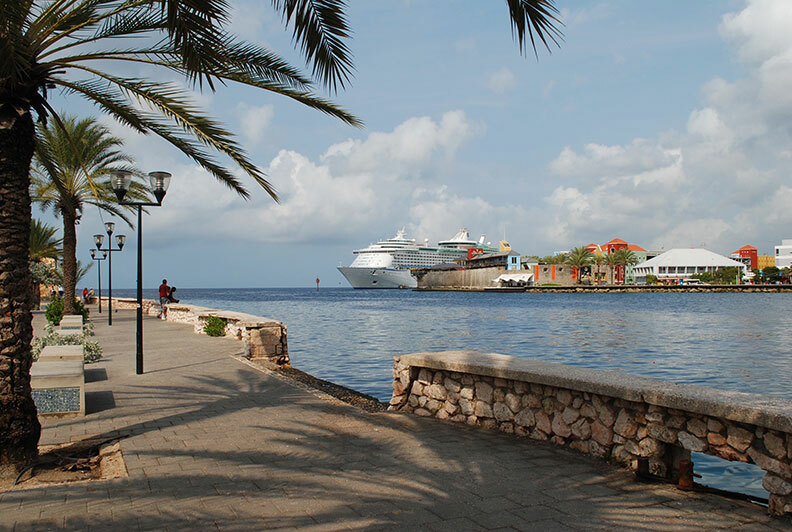 As your ship approaches, the Queen Emma Pontoon Bridge swings open to allow entry into this narrow inlet overlooked by the restored waterfront warehouses of colonial Willemstad. Added to UNESCO’s World Heritage List in 1997, Willemstad’s Dutch gabled buildings were first painted a variety of colors in 1817 when the governor complained that the sun’s glare off the stark white buildings was giving him headaches. Those same colorful buildings now house shops, art galleries and restaurants catering to tourists that fill the narrow cobblestone streets. But it’s easy to leave the crowds behind when strolling this picturesque port, starting with the waterfront promenade. This walkway leads seaward from the pontoon footbridge to the battlements of Waterfort at the harbor entrance. Soaking up the waterfront atmosphere in Willemstad. At the other end of this compact town is another pedestrian bridge, this one straddling the narrow Waaigat Canal. Here you will find a floating market where Venezuelan boats loaded with fresh fruit, vegetables and fish sell their wares. Tourists looking for trinkets are studiously ignored by locals buying their groceries. 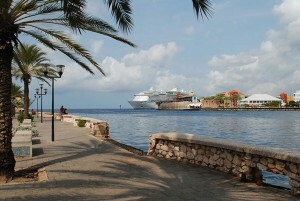 Large ships dock at the entrance to St. Anna Bay on Curacao. Curacao was originally colonized by the Spanish but it wasn’t until the Dutch West India Company took possession of the island in 1634 that the port of Willemstad was established. The resourceful Dutch found a new role for the bitter-tasting Valencia oranges the Spanish settlers had tried to grow – they discovered that the fruit’s sundried peels contained an etheric oil which became the basis for Curacao’s famous liqueur. The Curacao Liqueur Distillery is located in a former colonial mansion on the east side of Willemstad’s harbor, but we opted to spend the rest of our day in port by taking a taxi to the Hilton resort where a pleasant beach can be enjoyed followed by refreshments and lunch at an umbrella table on the patio overlooking the water. We were thoroughly enjoying our interlude here when the iguanas showed up. They were very bold and one of the males was extremely large. As they closed in on us, we began to gather up our things in readiness to leave. That’s when a guest at the next table, an elderly woman, cheerfully told us not to be afraid of the iguanas. Nonetheless, we decided it was a good time to return by taxi to the ship.